When I was in college I read the Little Flowers of St. Francis and was bowled over. I've been a fan of St. Francis ever since. Seriously, I'm daily tempted to preach to the birds, to try to convert stray dogs, and to chat with Brother Sun and Sister Moon. I've got a St. Francis figure on my night stand when I go to sleep and one on my office desk when I go to work. And I wear a St. Francis medallion around my neck. These images remind me to receive everything around me, from people to the natural world, as an occasion of joy. Just like Francis did. So at the Prison bible study this week I shared (of course) my favorite prayer, the one attributed to St. Francis. Many of the men in the study had never heard the prayer or of St. Francis. 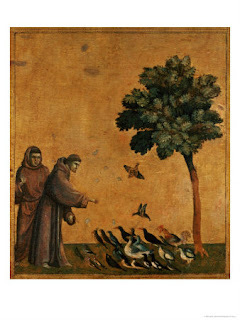 So I began regaling them with tales of St. Francis preaching to the birds or converting the wolf of Gubbio. After the study many of the men asked me for copies of St. Francis' prayer. So I'll be making about 50 copies of the prayer this week. I read the 'Little Flowers' during a research field-trip that I made as part of my first psychology degree 26 years ago. We spent 10 days on a tiny island named Lundy off the coast of Devon, England. Conditions (both domestic and atmospheric) were rough and ready. I spent every day tracking and filming the wild deer population with a friend and flopped exhausted into my sleeping bag each night to continue my journey with St Francis. It was a time of deep and wonderful joy in my life that I can still feel, smell, hear, touch as if it were yesterday. I've just got my battered second-hand copy off the bookshelf. A beautiful pocket hardback (inscribed 'To my wife: a memoir of Swannick, 1921. AWB.) in beautiful copperplate the colour of faded blood. One of the best comments ever. Thanks for sharing. I haven't thought of this poem in years; I used to consider this poem via John Michael Talbot; what a fond memory. I love this poem. This is what I'm realizing through encounter with your post and this poem. As much as I love being engaged in a science mind set--as well as one centered on Christ's way--when I read St. Francis's prayer, I wonder with stark amazement, "where on earth is a prayer like this given birth?" Certainly not in a lab or its equivalences. And such a prayer seems so disconnected from the Christian voice I hear in media, whether main or politically parochial. One pleasure I experienced in this poem, was to see that while I struggle with the periphery of Christian faith, there's a core that originally drew me in and continues to do so. [The] scheme is simple. There was once a soul in bliss. But bliss was lost, and the soul went unrecognized, even to itself. Only in and through tribulation and sorrow, on the wheel of fire at the summit of human experience, was the soul again acknowledged and recovered. The fairy tale tells us that we cannot grasp what we have until it has been lost, that only pain discovers the soul in its perfection. Only through suffering can human beings reach their ultimate potential; only by agony do they become who they are. Though I call it a fairy tale, the narrative forever verges on tragic myth: against the cliff Prometheus is bound and unbound, again and again. The premise of this fairy tale is the idea of the durable spirit, that old and cherished faith in the indestructibility of the human soul. This belief was powerful enough to ensure that the medieval familiarity with the effects of torture is not discernible in the age’s representations of hell, in which the victims are imagined to remain lucid. As Erich Auerbach so movingly observes in Mimesis, the denizens of Dante’s Inferno are not consumed by their ghastly punishments, but become more fully the individuals they are and have been on earth. Their essential character can only be brought into ever-higher relief; eternal judgment perfects it. Though each soul is given being by God, its individuality belongs to itself and is inalterable in essence.